DIZY, dit Montplaisir, MARGUERITE (Desbrieux), surgeon; baptized 11 Feb. 1663 at Trois-Rivières, daughter of Pierre Dizy, dit Montplaisir, and Marie Drouillet (or Drouillard), sister of Michel-Ignace; d. after 11 April 1730. Had it not been for all the commotion which accompanied her amorous intrigue with the soldier François Desjordy de Cabanac, Marguerite Dizy would have received scant attention from historians. At 14 years of age, on 4 Feb. 1677, she signed a marriage contract with Jean Desbrieux, whom she married soon afterwards. She had a son by him, François, who was two years old in 1681. In that year’s census the couple was reported to be living at Batiscan; the items enumerated were one rifle, five head of cattle, and six arpents under cultivation. Judging by a contract of 3 June 1673, Desbrieux’ land was worked by farmers or indentured employees, while the owner devoted most of the year to his fur-trading expeditions in the direction of the Ottawa and Nipissing Indian countries. 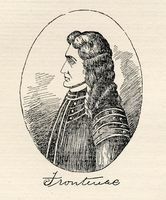 The lonely Marguerite was not unresponsive to the advances of François Desjordy, a half-pay captain of the colonial regular troops stationed near Batiscan. In Desbrieux’ absence, it was not long before they were living together. 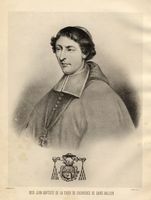 On 9 Feb. 1694, as the scandal had been going on “for several years,” the parish priests of Batiscan and Champlain, the Sieurs Foucault and Bouquin, read from the pulpit a pastoral letter from Bishop Saint-Vallier [La Croix] which forbade the lovers Desjordy and Desbrieux to enter these two churches. (There was, however, no question of an excommunication, as has sometimes been asserted.) The affair rapidly became complicated as regards Desjordy and his friend Jacques-François Hamelin* de Bourgchemin, Marguerite Dizy’s brother-in-law, but this is not the place to recount the ins and outs of it. In March, Marguerite Dizy addressed a first petition to the Conseil Souverain, requesting annulment of the pastoral letter and reparation for the offence of which she claimed she was the victim. Alert to the possible encroachment of the church upon matters concerning the state, Frontenac [Buade*] intervened in the dispute, and the suit was referred to the king’s privy council and was quickly forgotten. It seems that Marguerite Dizy practised the profession of surgeon; at least it was in this capacity that on 11 April 1730 she signed a certificate in a case involving wounding. The date of her death is not known. AJM, Greffe d’Antoine Adhémar, 4 févr. 1677; Greffe de Claude Maugue, 29 mai 1682, 11 sept. 1693, 30 août 1696; Greffe de J.-B. Pottier, 22, 23 sept. 1697. AJQ, Greffe de Louis Chambalon, 15 oct. 1700, 30 oct. 1714. AJTR, Greffe de L-B. Pottier, 12 oct. 1700, 14 nov. 1701 ; Greffe de Michel Roy, 3, 10 juin 1673, 4 aoûut 1673. “L’affaire du prie-dieu à Montréal, en 1694,” APQ Rapport, 1923–24. “Un compte de ‘chirurgienne’,” BRH, XXXII (1926), 167. Jug, et délib., III, IV, V. Recensement du Canada, 1681 (Sulte). Catalogue du Chiteau de Ramezay (Montréal, 1962), 151, no.1914. Ahern, Notes pour l’histoire de la médecine, 171f. Eccles, Frontenac, 299f., 303. Gosselin, L’Église du Canada, I, 114f. Raymond Douville, “Deux officiers ‘indésirables’ des troupes de la Marine,” Cahiers des Dix, XIX (1954), 67–98. André Vachon, “DIZY, Montplaisir, MARGUERITE,” in Dictionary of Canadian Biography, vol. 2, University of Toronto/Université Laval, 2003–, accessed April 25, 2019, http://www.biographi.ca/en/bio/dizy_marguerite_2E.html.